retirement income will last as long as they do. A message from the Chief Financial Advisor. 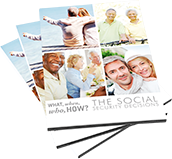 Learn the major retirement factors to consider in this free report, "The Social Security Decisions." 95 percent of our clients are near or in retirement. 89 percent of retirees are concerned about their long-term financial future in retirement. Advisory and Insurance services are offered through 360 Investment and Retirement Advisory LLC, a Registered Investment Advisor in the State of Missouri. The Social Security Decisions Report is provided for informational purposes only. It is not intended to provide tax or legal advice. By requesting this report you may be provided with information regarding the purchase of insurance products in the future.